Print Book 820 pages in 2 volumes (printed book) with downloadable forms Note: For print books, with MCLE's supplementation service, new supplements and revisions are mailed automatically with an invoice. If you do not want to subscribe, please check the opt out option during checkout. 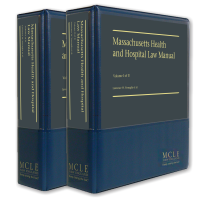 Taking an interdisciplinary, industry-based approach, MCLE's Massachusetts Health and Hospital Law Manual presents the many business and legal issues facing health care providers, payors, and other participants in the health care industry, along with the regulators overseeing them. This comprehensive manual focuses on health care delivery in its legal, business, regulatory, advocacy and personal aspects. Practice pointers and hypotheticals provide concrete guidance as you navigate the federalization, consolidation, bureaucratization, and increasing regulation of this dynamic area of practice. Medicare Part D: Closing The Donut Hole—See Chapter 2 for commentary on the beneficiary's responsibility to pay premiums and deductibles in 2017, along with notes on what an individual has to pay for prescription and generic drugs in 2017. Regulation of Providers and Payors—See Chapter 3 for updated directory information on state and federal agencies. Hospital and Taxes—See Chapter 4 for information on the IRS's 2016 denial of the tax exemption application of an accountable care organization ("ACO") that did not participate in the Medicare shared savings program ("MSSP") despite the "community benefit" it provided, and concerns among tax exempt hospitals that participation in such non-MSSP ACOs as members or partners may jeopardize the exemptions of tax exempt hospitals, or result in unrelated business income tax. Board Rules and Policies—See Chapter 5 for new policies surrounding the prescription of hydrocodone, along with many other state code regulations pertaining to board licensees. Medicaid Products: Managed Care Plans—See Chapter 7 for developments during 2016, pertaining to the Commonwealth's application for a new five-year waiver, permitting the Commonwealth to restructure MassHealth by using ACOs and other integrated care models. We at MCLE trust that you will find this material useful in your law practice and valuable in keeping your hospital and health care law library current. See Chapter 3 for a schedule that provides an overview of responsible agencies and references to the key implementing and operative statutes and regulations, local addresses, and other contact information, including the name of the individual responsible for the agency. See Chapter 4 for discussion of Chapter 224 of the Acts of 2012, An Act Improving the Quality of Health Care and Reducing Cost Through Increased Transparency, Efficiency, and Innovation (G.L. c. 6D). Chapter 224 establishes a new independent state agency, the Health Policy Commission (HPC), to monitor and review the impact of changes within the health-care marketplace. See Chapter 6 for discussion of the impact of President Obama's Fiscal Year 2014 relative to postacute care reforms, by proposing changes that would incentivize care delivery in the most efficient care setting, reduce readmissions, and better coordinate care. See Chapter 7 for information about accountable care organizations (ACOs), a type of integrated delivery system (IDS) that agrees under its arrangements with public or private payors to assume responsibility for providing a full continuum of health care services to payor beneficiaries and to accept payment under one of several methodologies designed to link payments to quality metrics and per capita health care costs. We at MCLE trust that you will find this updated material useful in your health and hospital law practice, and valuable in keeping your law library current.